PEOPLE SPEND MORE per gram on cocaine than any other drug. The global average spend per gram is €80. However, the majority of these economic gains don’t ever make it to the primary country of origin – Colombia. 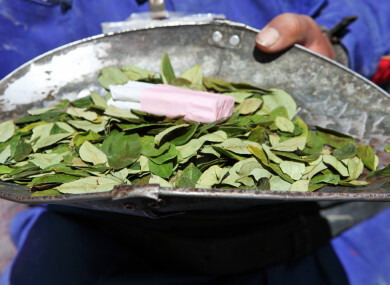 Coca leaf production in Colombia has reached record levels and increasingly diverse supply routes and multiple organised trafficking organisations ensure easy availability and increased purity across the European market. The cocaine trade in 2018 is booming. While cocaine use can lead to dependence and numerous health harms including death, the cost of the failed international drug control system and the national policies that implement it are far greater. The Global Commission on Drug Policy was set up by former heads of state and high-level former UN officials in response to the ongoing human costs of failed drug policies. They have recently put forward alternatives for control; alternatives that would help combat the harms on democracy and diminish the destructive power of organised crime that causes hundreds of thousands of deaths each year, loss of opportunities for those caught up in gangs and communities that find themselves powerless to harness the financial value of their crop. After seven years of releasing reports and signalling the many failures of the current drug control model, they have come out with a report which highlights a clear counterweight to prohibition: regulation, the responsible control of drugs. There is no doubt in their minds that this is the only way to put people, human rights, health and development at the centre of our drug policies. Existing laws mean it is hard to have honest conversations about drugs. Ideology blinds many people to accept the reality that for many people, drug use plays an important role in their lives, often for a few years, and that for the overwhelming majority of people, drug use is an episodic and pretty rare activity. Data from the last four years of the Global Drug Survey suggest that 75% of people use cocaine and most other drugs (other than cannabis) 12 or less times in the last year. These people tend to be otherwise law-abiding citizens – they have jobs, families, they may be into fishing, clubbing, yoga, they might even be vegan. But because cocaine is illegal, if they choose to use they have little choice but to indirectly support organised crime, human trafficking and an illegal market. Based on anecdotal evidence and ongoing surveys with people who use drugs, most of them would rather this was not the case. An additional component that would support a regulated market is the development of new guidelines to support self-regulation, as Global Drug Survey have already done for cannabis here. Actually, we have data from tens of thousands of people who use cocaine that could be used to develop these – and when funding arrives we’ll create it. Such guidelines would be a useful contribution towards the possible regulation of cocaine for recreational use. But unlike cannabis or MDMA – where production can be local to distribution – cocaine regulation would require agreements between producer countries such as Colombia and the regions of trafficking and consumption such as the Mexico, United States and Europe. Based on requests from partners in Colombia and Mexico, the 2019 iteration of the Global Drugs Survey will include questions about ‘ethically sourced’ or ‘fair trade’ cocaine. It will ask people if they would pay more for cocaine if you knew it came from a regulated (even fair trade) market, without the inherent destruction and chaos of an illegal market. And if yes, how much more? If you would like to take part in the 2019 Global Drug Survey, or to find out more information, visit its website here. Email “Would you pay more for ethically sourced cocaine?”. Feedback on “Would you pay more for ethically sourced cocaine?”.